Anyone that knows me reasonably well, knows that my favorite snack has to be chips. Yes, I’m an unabashed chip-a-holic. Growing up back home we had more brands than now, there were Lays yes, and Humpty Dumpty, but also Scotties (click the link for an image of those), and of course the big one of the time back home, Hostess. Hostess also had these 3 … monsters? as mascots, they even had stuffed toy versions of them, I’m not sure if they had a name or not, but they showed up at all the events. With a few exceptions (Dill Pickle, Ketchup (side note what ever happened to Catsup? )), I liked and like pretty much any kind of chips, but usually stick with the old standard “regular” or as they were and are known back home, plain. There were, however, three flavors released in the 70’s that even I couldn’t stomach. I have a vivid recollection of them. Going to the doctor in Clarenville was an adventure in patience as appointments had no real correlation with time as we know it. I’m sure there’s a research paper about the effects of time dilation in medical clinics there somewhere. The main medical office in Clarenville in those days was down on the lower road, and it had its own drug store (Budget Drug Mart I believe, though I’m not even sure it had a name then). As a kid while waiting for an appointment I’d be up and down the stairs there a dozen times, looking at comics, wandering, alleviating boredom any way I could, often involving chips. 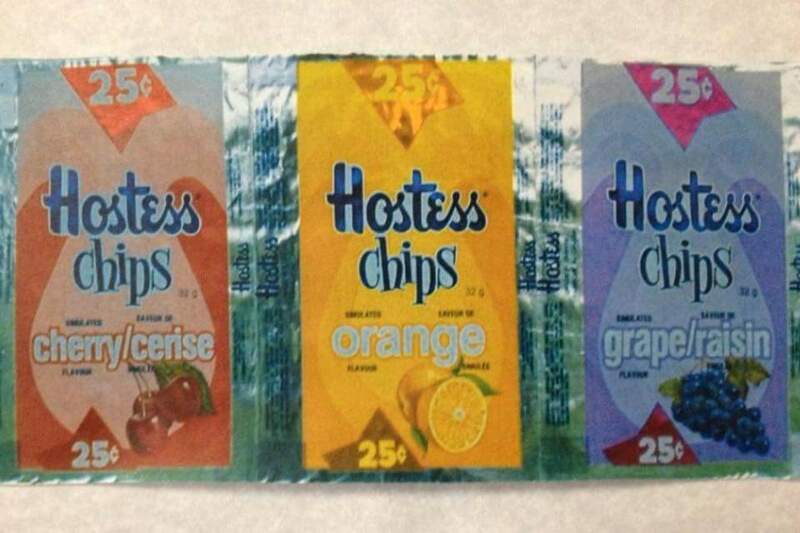 But for some reason, Hostess introduced Grape, Cherry, and Orange chips back then. Being a chip-a-holic they all had to be tried. But that was it. I don’t think I could even finish a bag. These had to be the most horrendous things ever produced as a snack! And oddly, now I want a package, just to remind myself how bad they were. Does anyone else remember these? Anyone have a picture?! They were, and the actual colored powder wasn’t all that enticing either! was like having your chips coated in Kool-Aid powder! I remember them too. They were awful. I forgot about the mascots. Hey where did you get a picture of the old fruit flavoured chips? Man they were nasty!